The algorithm to build new faces from the given faces and set of edges lying on this face. 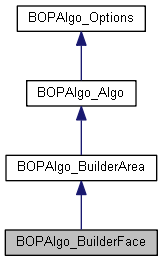 BOPAlgo_AlertNullInputShapes - in case the given face is a null shape. Build draft faces that contains boundary edges. Build finalized faces with internals. Build draft wires a)myLoops - draft wires that consist of boundary edges b)myLoopsInternal - draft wires that contains inner edges. Collect the edges that a) are internal b) are the same and have different orientation.